Today, keeping a pulse on design trends means looking beyond color palettes and furniture designs. As technology continues to permeate interiors and with an increased demand for more human-centric environments, the architecture and design community must extend their knowledge of how to create more comfortable spaces. Once mostly driven by a functional and aesthetic approach, commercial building design must now pay greater attention to considerations related to human health and well-being, and to the changing needs of a new generation of workers. Energy efficiency has long been a driver of building owners, with energy saving rebates and cost reductions leading the demand. For the last ten years, building owners have continued to implement more energy efficient solutions such as LED lighting, lighting control systems, Energy Star rated products, and more, not only as a cost-saving measure but as a way to attract tenants. A shift from maximizing energy efficiency to concentrating on how spaces are affecting human well-being is creating a new process for designing commercial offices. Organizations are leading the charge of future-proofing buildings and ensuring they protect their most valuable asset: their employees. By addressing the impact of the built environment on one’s health and well-being through design, organizations can achieve improved employee productivity, engagement, and retention, reduced absenteeism, and ultimately cost savings. Global building certifications such as the WELL Building Standard™ (WELL) are also contributing to an increased awareness of the importance of balancing human health and well-being with efficiency and sustainability. WELL was created using scientific and medical research and articles on behavioral and health factors that suggest a correlation between productivity and health benefits as they relate to building design, construction, and management. Now more than ever, designers are diving deeper into how they can create environments that maximize occupants’ comfort by addressing elements such as air, noise, and lighting in workplaces. The following are propelling changes in workplace design to promote well-being and create more comfortable environments. Building design and construction has entered the digital age with the introduction of the Internet of Things (IoT). The IoT allows for the connection of devices in commercial spaces to provide a host of advantages for both tenants and building managers. The integration of the IoT in commercial buildings allows for the monitoring and modulation of lighting levels and temperature, thus reducing energy costs and maximizing occupant comfort. LED luminaires, inherently electronic devices, are being used as data collection points, transforming luminaires from simple light sources to devices that support intelligent building management. These smart devices are known as connected luminaires. Connected luminaires integrate special features that include both light control functionality and non-lighting sensors, and they transmit data through wired and wireless networks. Because the sensors are integrated in the luminaires, a cleaner ceiling aesthetic can be achieved while providing maximum control. The integration of connected luminaires with intelligent building management systems provides building owners and tenants many benefits such as personalized control, optimized building maintenance, meeting energy codes and standards, and enhancing the comfort of those that work in the space. Networked systems offer a powerful value proposition and, as forecasted by the U.S. Department of Energy (USDOE), half of the lamps in the commercial sector will be connected within 10 years, a clear indication that connected lighting is the future. Incorporating this smart technology into current commercial workplace designs can serve both building owners and organizations by increasing tenant and employee retainment. Investing in IoT enabled devices is a cost-effective and future-proofing solution. Many manufacturers offer simple IoT solutions suitable for either new construction or remodel projects. As technology progresses and the desire for more human-centric environments continues to become omnipresent, employers are seeking new ways to distinguish their workplaces. While the IoT provides flexibility and energy savings it doesn’t address light quality. Humans have become accustomed to the warm glow of the incandescent bulb which mimics the natural light sources humans evolved under – sun, fire, and candlelight. The energy efficiency movement introduced the fluorescent light source, which lacked warmth due to its light spectrum distribution, resulting in greener and bluer tones. Now-common LEDs not only provide energy savings, they also offer more flexibility than fluorescent lighting with a light spectrum that can be altered. Recent studies indicate LEDs with an over saturation in the red spectrum were universally preferred by humans. These light sources render colors for human preference: skin tones look healthier, wood tones seem warmer, and colors are more vibrant, making objects appear more attractive. Improved metrics for assessing light quality are being considered by the lighting industry to better match human preference lighting. Version 2 of the WELL Building Standard™, currently available for project certifications, recommends the parameters defined by these studies at Feature L07 – Electric Light Quality. They are defined using metrics from the IES TM-30-18 as having a Fidelity (Rf) equal or greater than 78, a saturation or Gamut (Rg) equal or greater than 100, and an over-saturation in the red spectrum between one percent and 15 percent. Designers who are looking to create comfortable, natural, and visually appealing workspaces should consider advanced LED technology which meets those parameters. There is more to achieving occupants’ comfort than addressing temperature and lighting. A result of the open office design trend, workplaces have become noisier. When walls and private offices are eliminated to create more dynamic interactions throughout all levels of an organization, it creates another challenge in the workplace: acoustic comfort. These wide-open spaces typically contain hard surface materials: concrete or wood floors, exposed ceiling structures, and low-profile desks which lack sound absorption properties. To address noise level issues, organizations are installing acoustical ceiling systems. These sound absorbing solutions are enhancing architecture without compromising the design aesthetic of a space. They are available in many shapes, sizes, colors, and formats from decorative ceiling panels and cloud systems to baffles integrated with lighting solutions and contribute to creating a beautiful aesthetic while also controlling noise levels and reverberation. Manufacturers are constantly introducing new products that help support the trend toward a healthier and more sustainable workplace and the accelerator behind this movement is Generation Y, better known as Millennials. From an early age, they were taught to work in groups and they grew up in the age of the Internet and environmental consciousness, making them tech-savvy natural collaborators who care about their impact on the planet, all traits that have changed workplace design. Millennials have broken the model of the traditional 9 to 5 by staying connected through digital tools, replacing the standard workstation with open office areas or telecommuting. 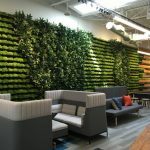 They also place a focus on work-life integration even more than work-life balance, as well as on health and wellness, exemplified by transformed work spaces that now include fitness centers, meditation rooms, cafes, and home-like amenities. According to a recent article published in The Economist, millennials now make up most of the workforce (37 percent), outnumbering Baby Boomers (34 percent). As the Baby Boomers enter retirement in mass, it comes as no surprise that Generation Y is taking over and so is their desire to impact the built environment by future-proofing buildings and creating more human-centric environments. We will continue to see millennials reimagine workspace design and implement policies to promote wellness and prioritize the human experience with more comfortable spaces. These changes will also add value to real estate properties and benefit building owners with continued energy and cost savings and attractive features for prospective tenants.